Because pops are fun ! Acroyoga in Iceland. Magic ! 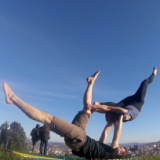 Acroyoga in mountains: best combo ! Some views from weekend in Antwerpen, with Josh Young, Lizzie Tomber and Kajia as teachers. Note that I just put here two or three nice moves they didi, but those three are really educationnal, nice, fun, and do a really good job with their workshop.